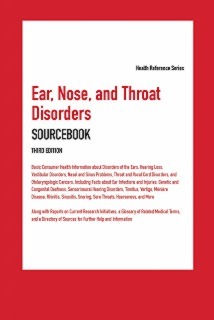 Ear, Nose, and Throat Disorders Sourcebook, 3rd Ed. Ear, nose, and throat are important organs of the human body as they perform several vital functions on a daily basis. Anatomically, they are located near each other and their functions are also closely related. Ailments of these vital organs are some of the most common illnesses troubling Americans today. Ear, Nose, and Throat Disorders Sourcebook, Third Edition provides readers with updated health information about the causes, symptoms, diagnosis, and treatment of diseases and disorders that affect the ears, nose, sinuses, throat, and voice, including ear infections, otosclerosis, cholesteatoma, hearing loss, tinnitus, vestibular disorders, vertigo, Ménière disease, rhinitis, sinusitis, deviated septum, sleep apnea, sore throat, laryngitis, tonsillitis, swallowing disorders, and otolaryngologic cancers. Current research initiatives are also described, along with a glossary of related terms and directory of resources for further help and information. Part I: Disorders of the Ears begins with an introduction to the anatomy and function of the ear. It describes disorders that commonly affect the ear, including ear infections and injuries. It also discusses the most frequently used diagnostic tests. Part II: Hearing Disorders provides a detailed look at the most common types of hearing loss. It explains how hearing loss is diagnosed and looks at ways to protect hearing. The part concludes with facts about electronic hearing devices, including hearing aids and cochlear implants, and methods of communicating with people who are deaf or hard of hearing. Part III: Vestibular Disorders looks at disorders affecting the sense of balance and the diagnostic tests commonly used to detect them. The ways in which aging, allergies, and other environmental factors impact the vestibular system are explained. The impact of vestibular disorders and the methods of vestibular rehabilitation are also discussed. Part IV: Disorders of the Nose and Sinuses describes nasal and sinus anatomy, and it details the disorders that most commonly affect the nose and sinuses. Frequently used diagnostic tests and surgical procedures are also explained. Part V: Disorders of the Throat and Vocal Cords offers information about sore throats, disorders of the tonsils and adenoids, laryngitis and other laryngeal problems, swallowing disorders, and disorders of the voice and vocal cords. Part VI: Cancers of the Ears, Nose, and Throat provides a detailed look at nasopharyngeal, esophageal, laryngeal, and other cancers that affect the ears, nose, and throat. Each cancer-related chapter includes a discussion of risk factors, symptoms, diagnosis, staging, and treatment. This part concludes with a summary of recent research findings regarding cancers of the ear, nose, and throat. Part VII: Additional Help and Information provides a glossary of terms related to the ears, nose, and throat and a directory of organizations that can provide further information.